Happy Friday Friends!! 4th of July is right around the corner and what better way to celebrate than to dress your baby up in a little Red, White & Blue! 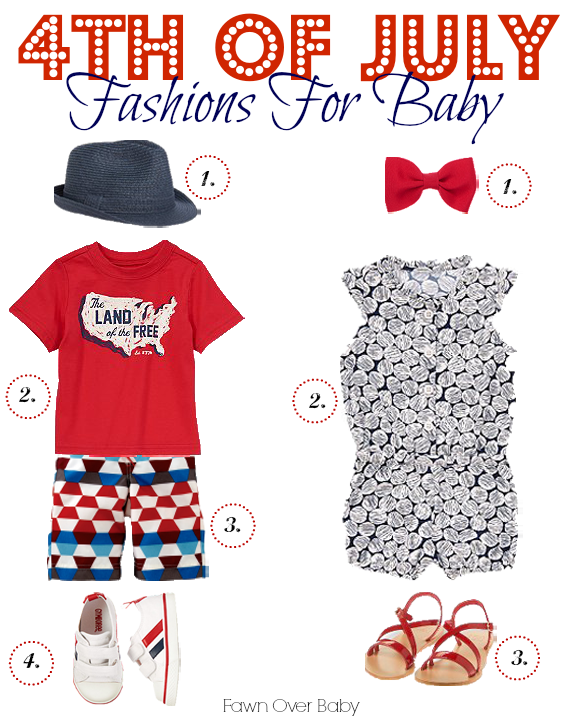 Today I put together a few 4th of July Fashions that your baby could wear loud and proud in honor of our great nation! Let's help our littles to celebrate our America in style and remember to teach them to give thanks to those who fought (and continue to fight) to keep our freedom sacred! All of these looks were found while searching my new affiliate friends' online shop! Gymboree, Crazy 8, Tea Collection and Janie and Jack have awesome deals going on right now, so it's a great time to stock up on some baby fashion goodies!